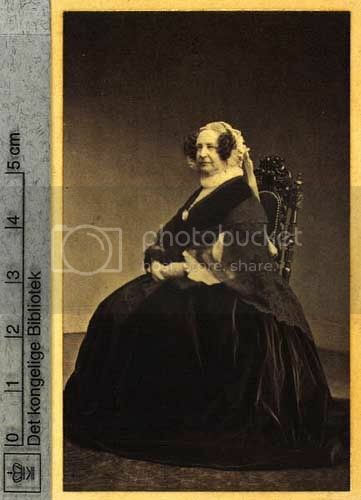 Does anyone have any interesting info or picture of Princess Juliana Sophie of Denmark(1788-1850),sister of King Christian VIII? Princess Julilana Sophia married Prince Wilhelm, Landgrave of Hesse-Philippstal-Barchfeld. From the geneology I read there were no issue from the marriage. Juliane married Prince Wilhelm in 1812, and had a quit and childless marriage with him, and they lived in Copenhagen. She refused to have intimit relations with her husband, because she feared dying in child-birth. (The prince had a mistress who he had 5 daughters with). Juliane liked food an became a very heavy woman over the years. She was liked by the royal family, but not considered a great personality, just like her husband. Why wasn't she or her husband considered great personalities...? I see. I think it was because they lived a very plain live, and didnt contribute with many things. Landgraf Wilhelm, attending his duties as an officer in the danish army, and spending time with his mistress, and Juliane staying home eating. They were also out staged in a way by her sister, Princess Charlotte and her husband, an intelligent and charming couple. 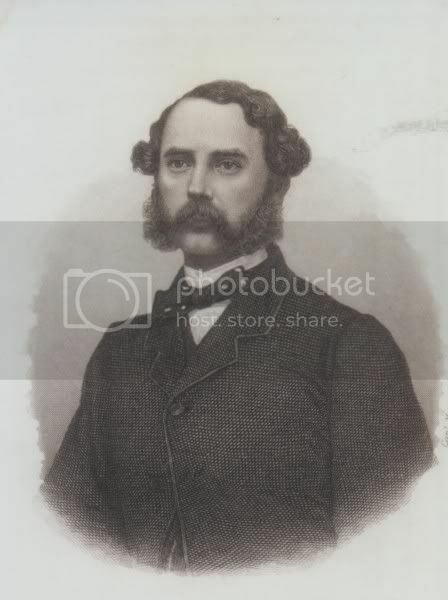 I am trying to find a picture of Caroline Amalie of Schleswig-Holstein-Sonderburg-Augustenburg Second wife of King Christian VIII. Although he died in 1848, she remained "Dowager Queen" until she died in 1881. She must have been at at least a few family functions. Any ideas ? I can't find her in any of my usual Danish resources. There is a photo of her in Bjarne Jensen's "Juvelerne I Det Danske Kongehus", and also of a pictue of a painting of her. She attended the christenings of the children of the the then Crown Prince Frederik (VIII), and I read that whenever Alexandra Princess of Wales visited Copenhagen she always visited her. I will try to find the reference. Everyone is where they want to be! 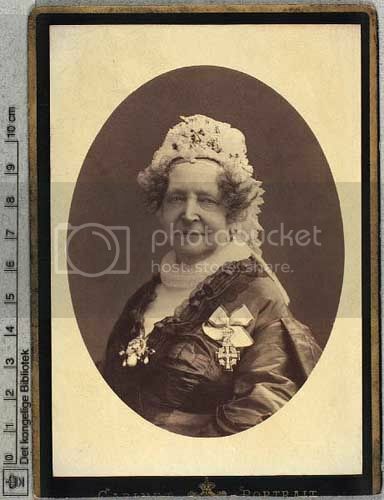 Two pictures of dowager queen Caroline Amalie. Kevin, the source you gave is a bit hard to come by in San Francisco. Even in our otherwise excellent public library. Guess we just do not have enough Danes here ! The pictures were exactly what I was looking for, Kmerov. I wonder why she does not show up more frequently in the family pictures of that era ? Caroline Amalie was popular in the royal family and they often visited her, and so did the foreign royalty when they visited Denmark. I don't know why she doesn't appear in family pictures but maybe she was to frail in her last years, or the big gatherings didn't take place after she died in 1881. But I also wonder why!